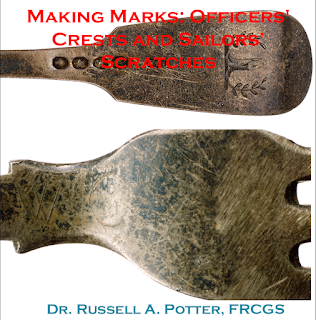 In just a few days, on November 29th, I'll be delivering a lecture, "Making Marks: Officers' Crests and Sailors' Scratches" -- at the National Maritime Museum in Greenwich, UK, in connection with their current exhibit Death in the Ice. It's a lunchtime lecture, hosted by curator Claire Warrior; after my remarks, she and I will have an open discussion, and welcome questions from the audience. The talk will start at noon, and with the discussion will go until 1 p.m.
scratching their initials onto them. In some cases, the letters are clear -- the WC on the Franklin fork above is William Clossan, though of course sometimes the initials match more than one man. Some, such as caulker's mate Cornelius Hickey, carved their full surnames, while in other cases the marks are ambiguous -- a scratched A? D? -- or perhaps simply a random pattern. The Inuit themselves sometime modified the utensils, as they did with a large serving spoon from Franklin's service; the bowl having become cracked, they mended it with copper (many Inuit were skilled at re-working and cold-forging metal). 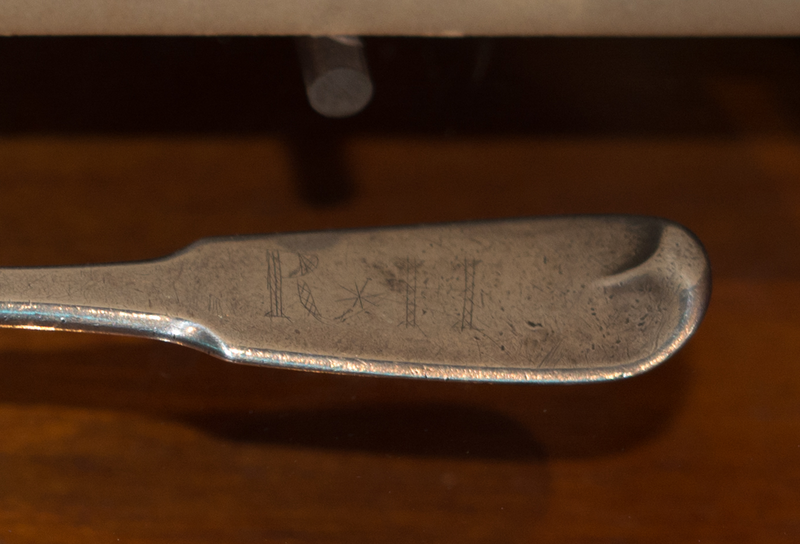 These additions allow us to trace, in many cases, the path of the silver item from the officers' mess to the crew of their ship, to Inuit who then exchanged these items with searchers such as Leopold McClintock, Dr. John Rae, Charles Francis Hall, and Frederick Schwatka. My talk will be illustrated with slides -- many of them the first high-resolution images ever made of the utensils in question -- and will be a reunion of sorts, with items not only from the NMM's own collection, but from museums around the UK, US, and Canada, and even from the island of Jersey, where a lone fork is preserved with other remembrances of Henry Thomas Dundas Le Vesconte, whose family was from there. 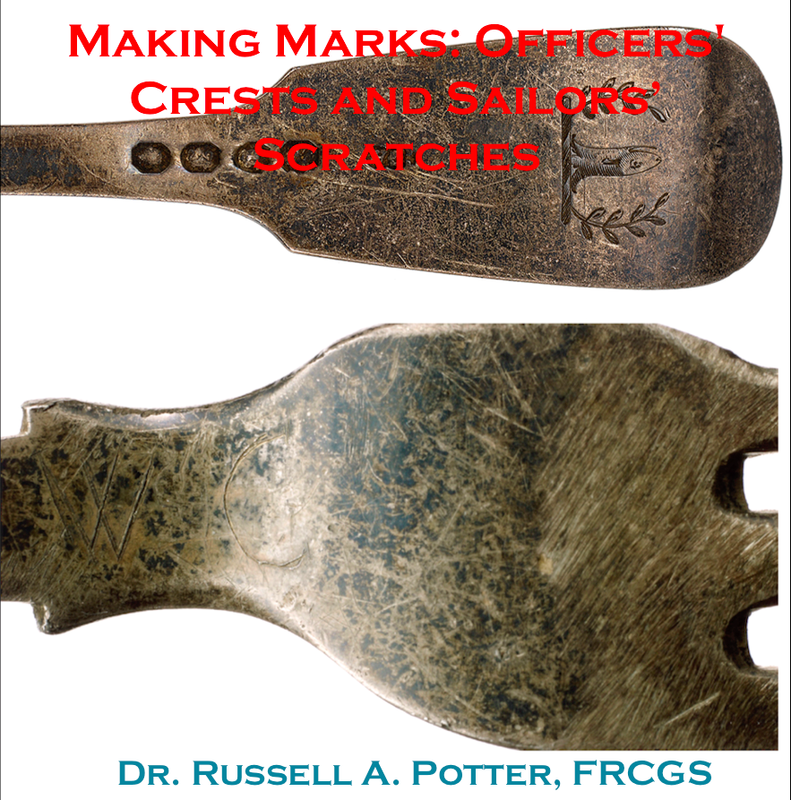 We'll also have a look at some of the plates recovered from HMS "Erebus" by the Parks Canada underwater archaeology team; some of them, too, have marks that suggest connections between the officers and crews. I'll also show maps of where the spoons were recovered, and what kind of story they tell of Franklin's men once they set foot on land. His ships -- HMS "Erebus" and "Terror" -- will have many tales to tell once archaeologists dig a little deeper into their holds, but until then, these humble souvenirs of ordinary sailors speak volumes as to the final journey their owners undertook. For some time now, I've been thinking about Paul Watson's book about the Franklin search, which has been published under the title Ice Ghosts. People have asked me about it, and as I'm generally reluctant to say unkind things about someone whose book might be seen as competing with mine, I've usually demurred. But now that the book is coming out in paperback, and is therefore likely to reach even more readers than before, I feel that it's my obligation to speak out. As the founding editor of the Arctic Book Review, now in its nineteenth year, I've had occasion to read, and often to review, all the many new books about the Franklin expedition that have been published since 1999. My personal library has nearly every book ever written on the subject, which runs to well over a hundred volumes. Some are rather silly -- a book by a woman in Florida who had psychic "conversations" with Sir John and Lady Franklin; the late Jeffrey Blair Latta's The Franklin Conspiracy, which marks the far outpost of what one reviewer dubbed the "Franklin lunatic fringe"; or the small self-published leaflets of homespun enthusiasts. But even among all these, Ice Ghosts stands out. It's one of those books that tries to beef up personal reportage with a large dollop of historical background, and turn the author's journey into a combination whodunit and adventure yarn. It's an approach that can work well for a writer with a journalistic background, and there's nothing wrong with the basic idea. However, not all journalists are as good at handling historical narratives that stretch over centuries as they are at dramatically retelling events of the present, and that's the case with Mr. Watson. The sort of "potted history" he has written is big and dramatic on the surface, but wanting in the kind of substance that can only be gained by longer study and the consideration of multiple sources. If these were the only issues with the book, though, I wouldn't feel as strongly as I do about it. Its inaccuracies may be due to mere carelessness, but it seems Mr. Watson's editor did no fact-checking. The errors are both numerous and substantive, such as having Lady Franklin pass through the Panama Canal (it wasn't completed until more than forty years after her death); James Fitzjames's letters to his sister-in-law are referred to as letters to his "wife" (he was unmarried); Parry's crucial 1819 expedition is missing from the book's chronology; winter and summer are confused with one another. Any book, of course, had some errors -- cataloging them is not necessarily criticism -- but Watson's are so numerous as to erode the confidence of any well-informed reader in what he has to say. The author's tendency to drift into purple prose doesn't help matters, nor does his decision to personify the Arctic as female ("That was the plan. The Arctic, as she usually does, decided otherwise"). Yet these, though they will doubtless frustrate many readers, aren't the real problems with the book either. As part of the story, Mr. Watson rightly wished to include the Inuit role in the search for Franklin's ships, and like many such, he decided to speak with Louie Kamookak, who's certainly the most important Inuk historian of all matters Franklin. Watson apparently interviewed him at length, and ultimately decided to make the results of the interview into a centerpiece of the book, dubbing Louie his "Inuk detective" and devoting most of two chapters to him. Unfortunately, Watson's tendency to expand and gussy-up the story got the better of him, and he ended up putting in material -- such his a story of Louie playing with a polar bear paw as an infant -- that was completely inaccurate, and untrue to Inuit culture generally. To make things worse, he never gave Mr. Kamookak a chance to look over what he'd written, so that by the time he saw it, the page proofs were already printed. Louie wrote a letter to Watson, asking him in the strongest terms to remove this material, and Watson flatly refused. It's an odd way to try to honor Inuit oral history by misrepresenting, and then insulting, one of its leading historians. And then there's the matter of the discovery of HMS "Terror" in 2016. Watson, as many at the time will recall, published an exclusive news story with The Guardian about the find. Why was it exclusive? Well, because Watson had been given the story several days (at least) before the Arctic Research Foundation, whose vessel the Martin Bergmann made the discovery, had notified either its partners at Parks Canada (under whose permit they were operating) or the government. During that time -- nearly eight days in all -- the crew of the Bergmann first dispatched several cameras in a net (which snagged on the wreck, possibly damaging it, and was lost) and later, having doubled back to Cambridge Bay on the pretense of engine repairs, dispatched a ROV with which they made and edited a substantial video, at one point directing the ROV below decks and capturing imagery of a cook's pantry or storeroom. It's shameful that the ARF failed to notify its partners for so long -- and it's criminal that they depoloyed a camera bag and a ROV on the wreck, since they had no permit to conduct such a search. In fact, the permit, issued to Parks, specifically excluded Terror Bay as a search site. At the behest of the Government of Nunavut, the RCMP launched a months-long investigation, which ended without charges being filed. Nevertheless, the language of the Nunavut Act is quite clear that to approach within 20 meters of an underwater site without a permit is forbidden. And, as the chronicler of this act, who was aware of it (and should have been aware that it was illegal), Watson is, I believe, complicit in it. And this is the most serious problem of all with his book: no one reading it will know anything about the above issues, as Watson simply omits them. Watson's book, and the fact that it has been taken as somehow authoritative, has something in common with ARF's deployment of cameras and a ROV -- it actually damages the thing it claims to protect. Yet unlike those actions back in 2016, Ice Ghosts will continue its damage every time someone reads it, likely for years to come. It's especially frustrating, given that it appears under the imprint of W.W. Norton in the United States, a publisher whose textbook arm is known as authoritative, and which has a (deservedly) high reputation for quality publications. And so, in the interests of placing the full facts in the hands of its present and potential readers, I've decided to speak out.